As Coastal Living Magazine’s pick for “America’s Happiest Seaside Town,” Stuart, Florida—and the rest of Martin County—has a pretty nice handle on happy hour dining. For dinner and a show, snag a seat at one of these waterside restaurants, then finish your evening with shopping, art galleries, live music, and a stroll along one of Martin County’s blue lagoons or natural sand beaches. Even in winter, the water shines with technicolor blues and greens as far as the eye can see, and clear skies overhead set the stage for gorgeous South Florida sunsets. How’s that for a happy meal? A favorite Stuart hotspot, Riverwalk’s service is simply remarkable. With a cozy dining room, great views of the water, and house favorites like Ahi Tuna Nachos and Oysters Rockefeller, you can order in courses and make dinner the main affair. Feel free to stick around a while, too; There’s no rushing customers out to turn tables, and the warm and attentive wait staff is happy to leave you to it, or stick around and chat. Fancy yourself a foodie? 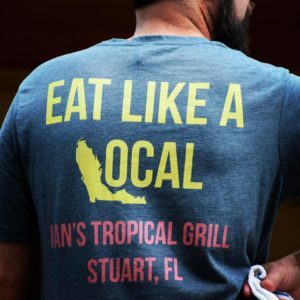 Make plans to grab a table at Ian’s Tropical Grill in Stuart. This Martin County hot spot serves up an interesting menu of culinary curiosities, including ramen noodle croquettes with Sriracha marinara, Mexican street corn served with Key West pink shrimp, and their beloved Day Boat Scallops. Grab a seat on the beautiful garden patio and enjoy one fantastic meal. After lounging the day away on Jensen Beach, grab lunch at Sand Dune Café – a casual eatery just steps away from your beach chair (speaking of, don’t have a chair? The Sand Dune will rent you one, and even throw in an umbrella!). Feel like dining by the beach? Grab a hot dog to go and sink your toes in the sand. The local joint serves up unpretentious breakfast, lunch and snacks from 8 a.m. – 4 p.m. everyday, meaning you can stop by for a bite post-dip, sandy legs and all. Situated on the beautiful St. Lucie River in downtown Stuart, tiered deck seating means every table at Stuart Boathouse offers a stunning, unobstructed view of the river. Nosh on small plates, like the Tuna Stack, seafood tacos, and decadent steaks as you watch the boats glide across the water at this Stuart sanctuary. This colorful and quirky little coffee shop is brimming with personality. Sip a cappuccino in the early morning hours on their front patio as the sun makes its grand appearance for the day, or enjoy a glass of Italian wine under the twinkling lights of the Blue Door Coffee Bar’s courtyard. Need more reasons to dine al fresco in Martin County? Check out Discover Martin’s shortlist of waterfront dining spots in Martin County.